Nissan's decision confirms that the Car of the Future program is high on the agenda of V8 Supercar teams and potential new manufacturers. V8 Supercars expects more manufacturers to follow Nissan's lead given the high profile of the sport domestically and internationally. The sport intends to grow to 18 events world-wide (up from the present 15 Championship events) across 40 weeks in the coming years. Nissan's entry into the V8 Supercar Championship reflects its brand promises of “innovation and excitement”: innovation with the Car of the Future program, and excitement through the attraction and popularity of V8 Supercars. V8 Supercar Chairman Tony Cochrane, who announced the Car of the Future program in March 2010, said it confirmed the global demand for V8 Supercars by manufacturers and destinations was very real. “We welcome Nissan with more than open arms,” Mr Cochrane said. “I couldn't be more excited with the opportunity Nissan has offered Todd, myself and the entire team at Kelly Racing to become their official factory team,” he said. “Nissan's genuine enthusiasm, unwavering support and absolute professionalism through this evaluation has been tremendous and underpins their absolute intentions of Championship success in the category - a dream we share and hope to deliver on. 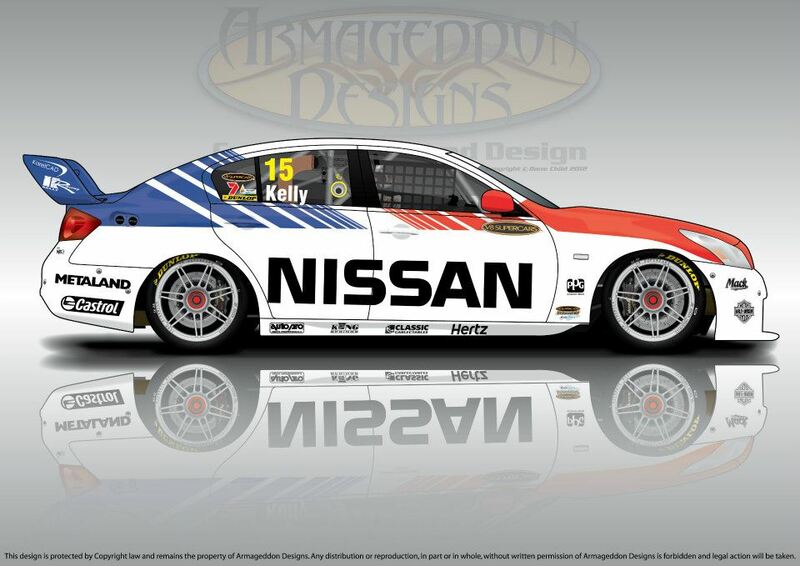 Business partner and elder brother Todd Kelly said Kelly Racing’s innovative business strategies fitted perfectly with Nissan's desire to enter the V8 Supercar Championship. “Rick and I have had one clear goal that we have been striving for since we started Kelly racing, that was to become a benchmark race-winning team with factory support,” he said. “The timing with Car of the Future has enabled us to engage a manufacturer and achieve that. We couldn't be happier to be a factory Nissan team and Factory Nissan drivers. Car of the Future architect Mark Skaife said the ground-breaking announcement was only the start. “This opens up a whole new chapter for V8 Supercars,” Mr Skaife said.